This list was made according NATO and Yugoslav sources. IT WAS the first dogfight of the air campaign. On paper it was an equal match - American F15s and a Dutch F16 against Yugoslav Air Force Russian-made MiG29s - but superior pilot skills and technology won the day for the NATO aircraft. 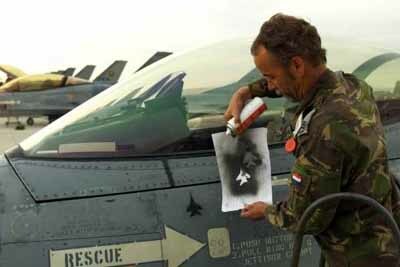 Eight aircraft were involved - five MiG29s, two F15s and one F16. Although they were not all engaged in the same dogfight - the aerial combat took place in different parts of the war zone airspace - the result was three downed MiG29s and the safe return of the three NATO fighters. The MiG29 is the most potent fighter aircraft in the Yugoslav Air Force. It is armed with two air-to-air missiles, the AA11 Archer, which has a range of about 10 kilometers, and the 50-60 kilometer-range AA10 Alamo. The Germans, who acquired some MiG29s after the divided Germany was reunified, have been impressed by the agility of the short-range Archer. It compares favorably with any Western short-range air-to-air missile. The MiG29 itself is also a more agile aircraft than the American F15C or F15D and, skill for skill, could out-maneuver the US jet. The F16, on the other hand, matches the MiG29 for versatility. However, the MiG29 pilots will have had no combat experience, and although on paper the Yugoslav pilots were flying one of the best aircraft to come out of Russia, the reality of war provides the ultimate test for both flying machine and its flier.